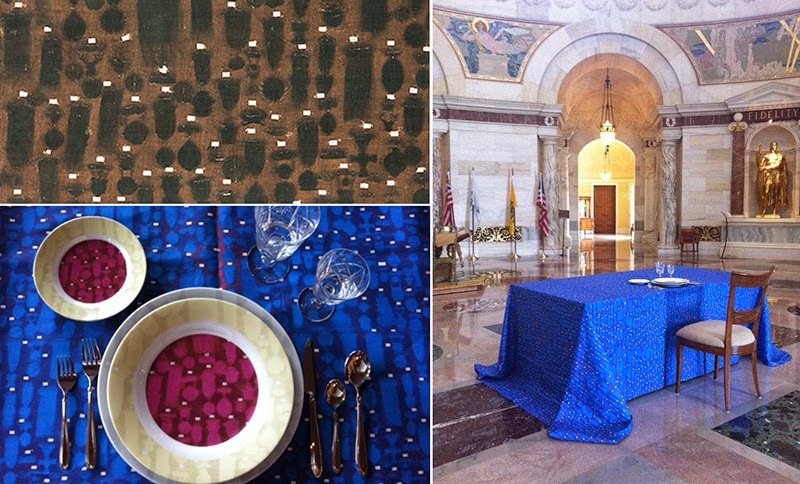 Shadows of absent Elks' medals and ribbons are printed on the tablecloth and dinner plates in DOEprojekts' participatory installation titled "Place Setting." We consider questions such as "In spaces such as the Elk's National Veterans Memorial, how is culture 'fed' -- to our generation and future generations?." and "How are we nourished by such patterns?" Viewers are free to participate in the installation by sitting in the dining room chair. As collaborative artists, we are drawn to these shadowy shapes because, not only do they reference the act of memorializing itself, but also they have a formal relationship to the Coreforms we use as a point of departure. Coreforms include, but are not limited to, zero (circle), one (vertical line), tilde (swash), hyphen, (horizontal line) and period (point). Keywords considered are: Country, Experience, Freedom, Government, Heritage, History, Ideology, Memory, Narrative, Person, Resistance, Time. "Invoking the Absence: Chicago Sculpture International Biennial 2014," curated by Lucas Cowan, is installed at the Elks Veterans National Memorial, 2750 N. Lakeview Avenue, Chicago. The public is cordially invited to the exhibition opening, which will include artworks by 22 artists who identify sculpture as one of their mediums. The opening reception will be held on Saturday, May 17, from 5 to 8pm. The exhibition runs from May 17 to October 26, 2014. For more information, please email info@chicagosculptors.com.